The publication of this work, the Mudraraksasa nataka katha of Mahadeva marks the first step of a planned attempt by the administrative Committee of the Sarasvati Mahal Library, Tanjore to bring out some at least of the rare works, in Sanskrit and Tamil, to be found in the archives of the library, after careful and scholarly editing Conditions of ‘War emergency’ have created special difficulties in the path of intending publishers, both with regard to procurement of paper and the actual processes of printing, and it may be sometime before the Administrative Committee is enabled to bring out any publication of the longer Manuscripts, but it is a matter for some satisfaction that this short but interesting prose work of Mahadeva is now before the public in an acceptable form. Love of learning, schools and works of intellectual eminence has deep roots in our cultural and civilisation. Even when the patronage of Kings and Courts declined, men in this country have kept alive the small fl-me of knowledge and enquiry. The attitude of Browning’s ‘Grammarian’ - “Grant I have mastered learning’s crabbed text. Still there’s the comment,” is typical of the avidity of our own savants in the persuit of Truth. It is to be hoped that in these days of a spreading democracy, these values will not be lost and that an ardent public support will replace the patronage of royalties. The Committee is deeply beholden to Dr. V. Raghavan, M. A., ph. D. of the Madras University, for the scholarly care, thoroughness and accuracy with which he has performed the important task of editing this work. A glance at the Table of Contents will show the facilities for reference and study provided by the Editor. The Committee must also express its indebtedness to the authorities of the Madras University for granting the necessary permission to Dr. Raghavan to undertake this labour of love. The Mudraraksasanatakakatha of Mahadeva is published here for the first time from a single manuscript of it preserved in the Maharaja Serfoji’s Sarasvati Mahal Library, Tanjore. It is a short prose work giving the story of the famous drama of Visakhadatta, the Mudraraksasa, in the form of a simple narrative and may be found suitable as a Sanskrit Prose Text for the Intermediate Classes in the Universities. In this book is to be seen the modest beginning of a series of publications which the Sarasvati Mahal Library is inaugurating, and I am thankful to the Administrative Committee of the Library, particularly to its President Sri M. Aantanarayanan, M. A., I. C. S., Dt. Judge, Tanjore, and to the Hony. Secretary, Sri S. Gopalan, B. A, B. L., Tanjore for inviting me to edit, this work for the Library. It is a matter for congratulation that besides running a Journal, the Library has started the Sarasvati Mahal Series of publications in which will appear editions and works based on the rare and rich manuscript material available in the Library. The single manuscript of this Katha available in the Tanjore Library is not noticed in the Catalogue of the Library; it is in Telugu characters and the material is rough country paper measuring 71/4” X 101/4” and numbering 33 sheets; It is bound in cardboards made up of similar paper, pasted together and containing some Tamil matter; here and there are to be seen some extraneous Telugu scribblings. The mistakes in the manuscript are few and these eave been corrected in the text presented here; in one instance (p. 5), I have restored a missing word on the basis of an external testimonium, and in another (p. 35), I have reconstructed a corrupt passage. I am thankful to the Library Staff for providing me with a Devanagari copy of the text, and to Dr. N. Venkataramanayya, M. A., Ph. D., Reader in Indian History, University of Madras, for helping me to compare this copy with the original Telugu manuscript and correct the slips. At the end of the work, I have given textual, traditional and historical Notes, an Index of the characters in the story with a brief description and account of the part played by each, and an Index and Concordance of verses and prose passages taken by Mahadeva from the original drama. 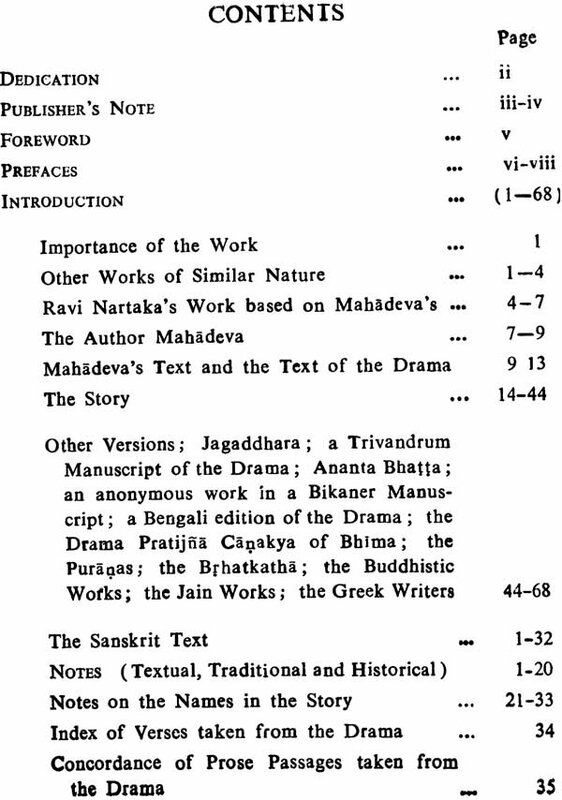 My Introduction in the beginning deals with all the known works which concern them-selves with the story of the Mudraraksasa, the author Mahadeva and his work, his probable date and the relation his text bears to the Drama; to these I have added a free translation of Mahadeva’s text, and accounts of the story of Nanda, Candra gupta, and Canakya as found in the several Brahmanical, Buddhistic, Jain and Greek sources. The book will thus be useful not only to students who study the difficult drama of Visakadatta in their college courses, but to those students of history who are interested in Mauryan research. My thanks are due to the authorities of the University of Madras for permitting me to edit this work for the Maharaja Serfoji’s Sarasvati Mahal Library, Tanjore and also to the Proprietors of the Srinivasa Press, Tiruvadi, Tanjore, and Messrs. Thompson & Co., Madras for executing the printing work. As one who had worked in the Sarasvati Mahal Library once, I feel gratified at the opportunity afforded me to associate myself with the work of the Library, and I appeal to all scholars and patrons to bestow greater attention on a Library which possesses one of the best and biggest manuscript, collections which South India might well be proud of, and help the Library to further its activities and make itself more useful to the public. The Mudraraksasa is one of the few Sanskrit dramas possessing a dominant story interest. This interest pertains not only to the events falling within the scope of the drama but comprehends the historical or quasi-historical background against which the theme of the drama has to be understood. The multiplicity of the incidents and their intricate interweaving in the drama-part of the story and the variety and confusion characterising the versions of the historical background of the story have both rendered the understanding of the Mudrarsksasa difficult. Scholars had therefore found it necessary to tell the story of the Mudraraksasa in the form of a simple narrative. Such narratives as we know of are of four kinds, those that give an account of the historical background only, those that cover the story of the antecedents together with that of the drama, those in prose and those in verse. Aufrecht records in his Catalogus Catalogorum (1. p. 461 ) two Oppert manuscripts of a Mudraraksasa-kathasara, one in Bhavani, Coimbatore District, and another in the Maharajah's Palace Library, Trivandrum, Nothing can be known of the identity of the former manuscript; the latter, it is probable, represents the work of Ravi Nartaka which we shall notice below. 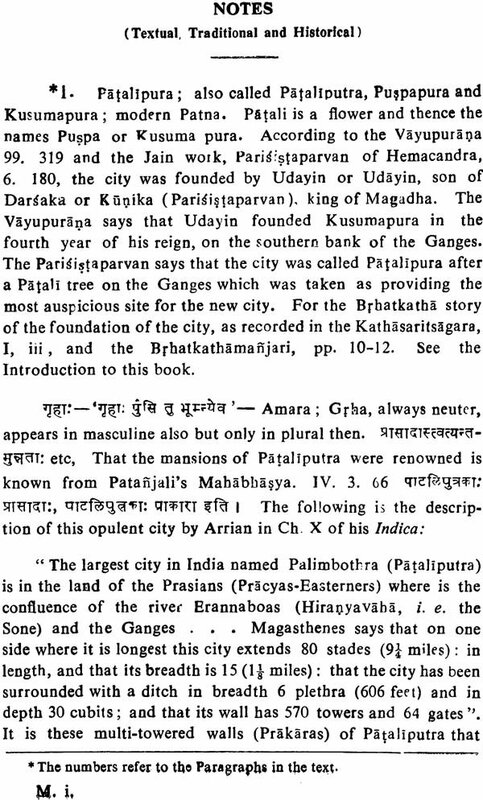 Anaota Bhatta of Punyastambha on the Godavari, son of Tryambaka (Timaji) Pandita and grandfather of the logician, Mahadeva Punatamakara, is a well-known scholiast of the middle of the 17th century A. D. He wrote his gloss 0n Govardhana's Aryasaptasati in 1645 A. D., and his gloss on Bhanudatta's Rasamanjari in 1636 A. D., at Benares. He wrote also a small work called Mudraraksasa-pnrvaprthika or Mudraraksasa-purvasankathanka. This work is in prose and deals only with the introductory story leading up to the plot of the drama. Rajendralal Mitra describes a manuscript of it in his Notices IV, No. 1654, and there are two more manuscripts of it in the Anup Sanskrit Library, Bikaner. The first version given by Jivananda Vidyasagar in his edition of the Mudra-raksasa is a summary of Ananta Bhatta's work. In the Bikaner Library there is another manuscript containing an anonymous version in prose, concerning itself, like Ananta's with only the events leading up to the plot of the drama. The third account is by Dhundhiraja, the well-known commentator on the Mudraraksasa, who prefaces his commentary with a metrical resume of the incidents which happened before the action in the drama begins. 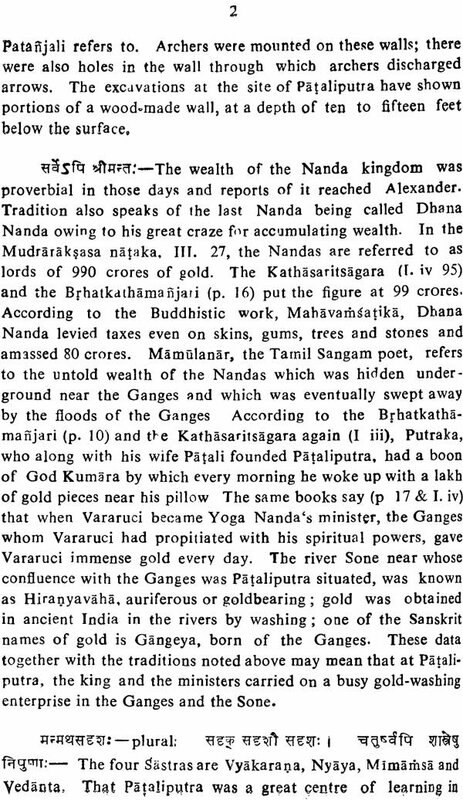 Dhundhi belonged to a family called Vyasa, was the son of Laksmana, a resident of Svamimalai near Kumbakonam in the Tanjore District, and a protege of Tryambaka Yajvan, a the minister of Serfoji I (A. D. 1711-1720) of Tanjore. Dhundi finished his gloss on the Mudraraksasa in A. D. 1713. 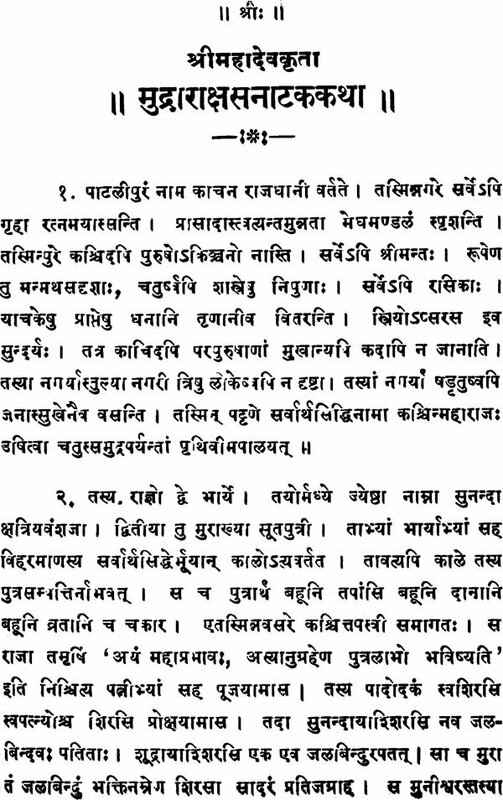 This metrical version is printed in Telang's edition of the Mudraraksasa with Dhundhi's commentary, and the second version given by Jivananda Vidyasagar in his edition of the drama is based on Dhundhi’s verses. Dhundhi's account agrees with that of Mahadeva edited here. 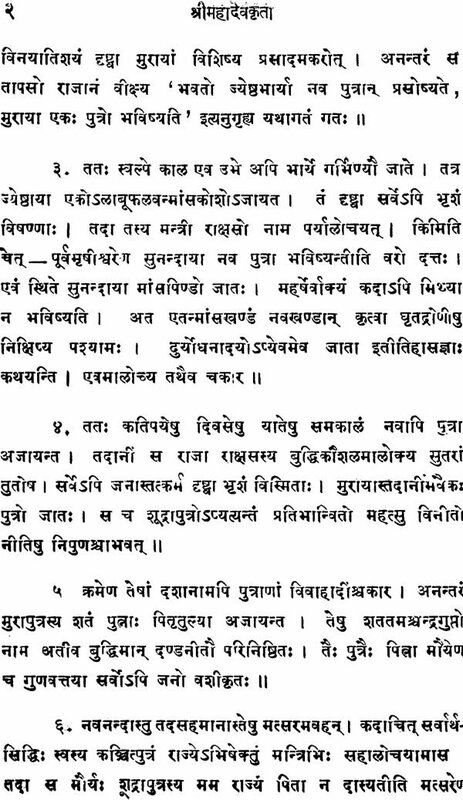 The fourth is the Mudraraksasa Kavya by Vidyaraja, a ms. of which is noted in the Catalogue of the Sanskrit mss. in the Punjab University Library, Vol II.p.262 No.4501. Vidyaraja describes himself as the chief minister, Mahamatya, of a chief of the solar line. The work is a metrical resume of the drama in the regular Kavya style, and the incomplete Lahore ms. comprising 87 folios extends up to part of the 20th canto of the work. Tradition says that the famous Kerala scholar Narayana Bhatta of Melputtur (A. D. 1559-1666) composed most of his Prabandhas or compositions intended for the dance- exposition called Cakyarkuttu for a Cllkyiir friend of his named Ravi. This Ravi Nartaka produced a metrical version of the entire story of the drama as well as the events that preceded it. This version may be called the Canakyakatha and many manuscripts of it are found in the several manuscript libraries. 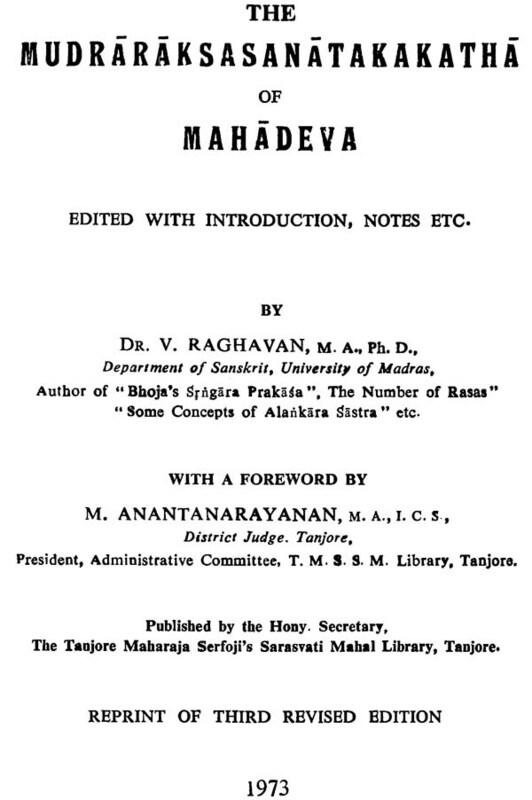 Ravi's work has been published, with a commentary by Rajagopala of Madura (Madras 1882) and by Satish Churn Law (Calcutta Oriental Series, 6 Calcutta 1921. While describing an India Office manuscript of this work (No. 7124) Dr. A. B. Keith characterises Ravi's production as a 'version in slipshod verse '. When Ravi comes to the drama-part of the story, he no doubt hurries over the narration, but his verses, especially in the earlier part of the work, are very well turned out and strikingly accomplished. The sixth work giving an account of the Mudraraksasa story is the prose version of Mahadeva printed in the pages that follow. This work called the Mudraraksasa-nataka-katha deals with the story of the drama and the incidents that preceded the theme of the drama. As Ananta Bhatta, Dhundhiraja, and the unknown author of the other version in a Bikaner manuscript have all dealt only with the incidents which led to the theme of the drama (Purvapithika), and as Ravi Nartaka's version hurries over the drama portion of the story, Mahadeva's here presented for the first time in print, is the only work available now that gives us a full and good narrative of the entire story, of the drama and its antecedent events.